After two years of dogged fundraising — and raising of eyebrows throughout Massachusetts — one woman’s dream became a reality. In a time when higher education for women did not exist. When educating women was seen not just as unnecessary, but as harmful and subversive. Inside one formidable woman’s bonnet-covered head, a revolutionary idea stirred. Why shouldn’t women have access to education? Why shouldn’t that education be rigorous and affordable? Criticism of her “unladylike” plan was pervasive, but it was not persuasive enough to quash her ambitions. 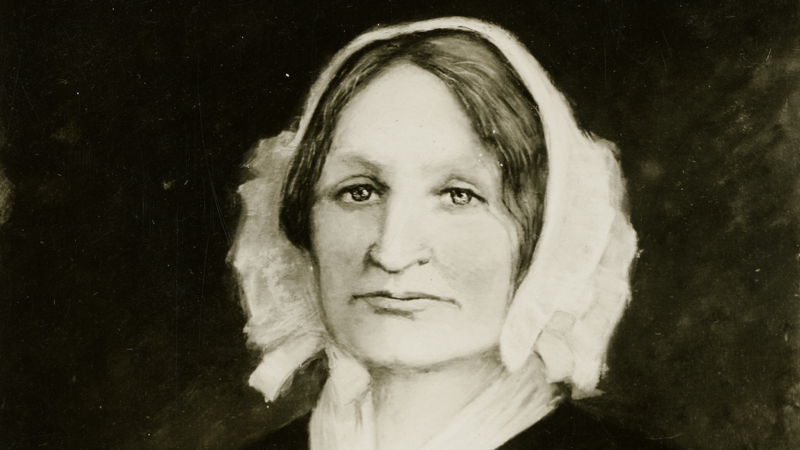 Mary Lyon, the founder of Mount Holyoke College, braved obstacles and overwhelming societal assumptions in the two years leading up to November 8, 1837. 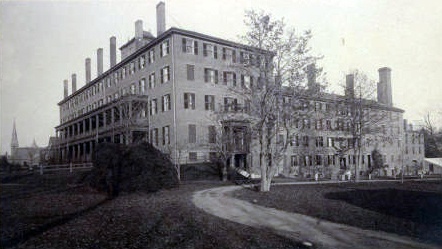 On this day, the newly built Mount Holyoke Female Seminary opened its doors to 80 students who had braved entrance examinations in grammar, math, history and geography. For many, their arrival came after days of arduous travel. And yet they came. For intellectual opportunities and a curriculum on a par with that available to men in the Ivy League. To take control of their own lives and to improve themselves and the wider world. To become, as Mary Lyon envisioned, capable of “clear thought and self-directed action toward righteous ends.” Each student brought, as instructed, a Bible, an atlas, a dictionary and two spoons. 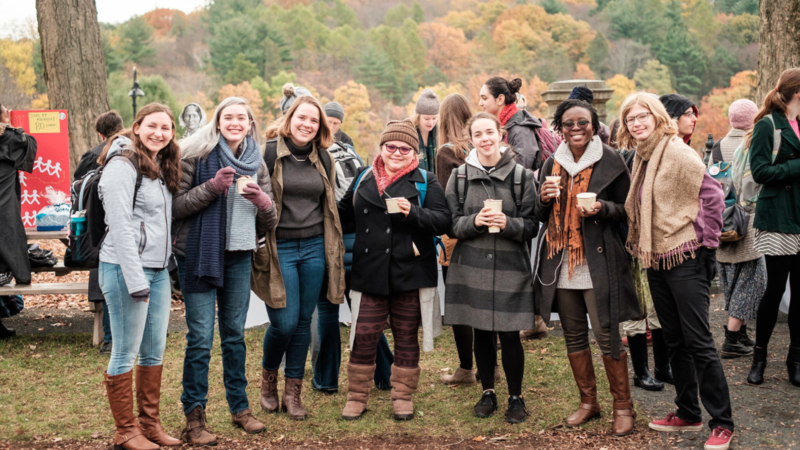 Every November since 1891 — save for 1916’s polio epidemic — the Mount Holyoke community has celebrated Founder’s Day. 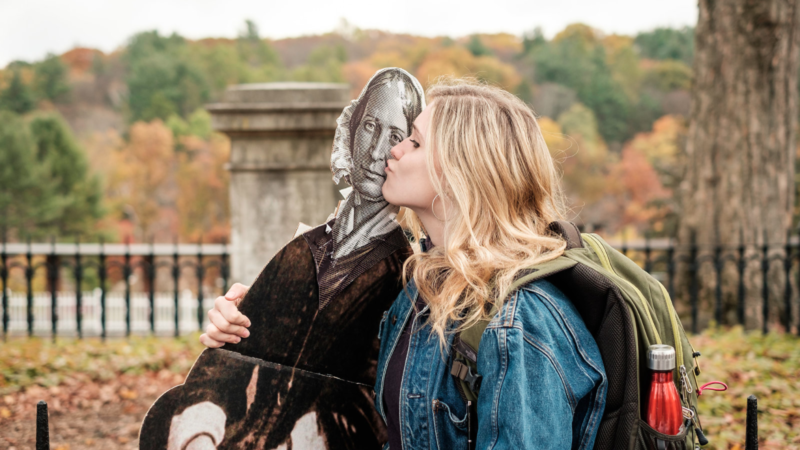 The particulars surrounding this annual tradition have evolved over time, but at its core it remains a day to reflect on the powerful legacy that one changemaker can impart to future generations. Early iterations involved decking out Mary Lyon’s grave site, centrally located on campus, with flowers and wreaths. During more formal times the day was celebrated in more formal ways, with speeches, honorary visitors, and students and professors dressed in full academic regalia. Ceremonies to lay the cornerstones for new buildings on campus or to dedicate them were often saved for — and celebrated on — Founder’s Day. Starting in the 1910s, first-year students were routinely hoodwinked by upperclass students on Founder’s Day. Eager firsties would arrive at Mary Lyon’s grave site at 6:00 am for some promised ice cream, which was to be churned up and served up by College trustees. Around 1920, the early morning Founder’s Day ice cream was actually there, courtesy of some benevolent seniors. 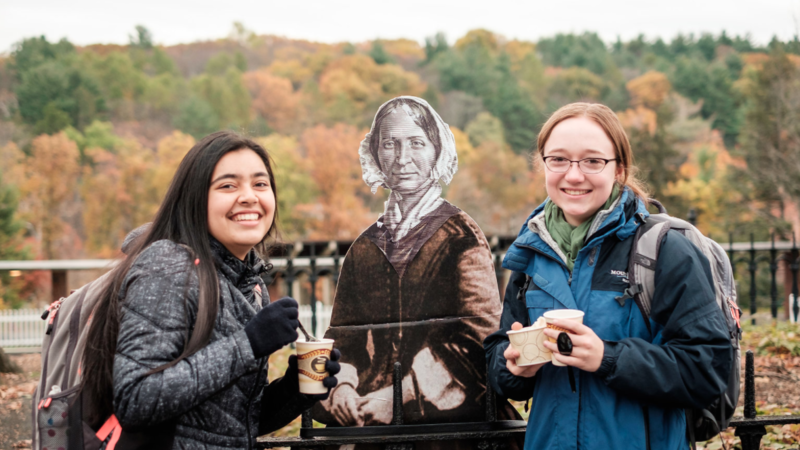 And hence another tradition at Mount Holyoke got a little sweeter, with College officials getting in on the ice cream–serving and scooping act. Today Founder’s Day is largely a chance for students — especially seniors, who often try on their graduation robes for the occasion — to gather at an appointed morning hour and eat ice cream. Sound chilly? Hot chocolate helps. As does hot cider. And it’s a day for the College to pay warm homage to a woman who changed the trajectory of so many lives — for the better. Raise a spoon to Mary Lyon! 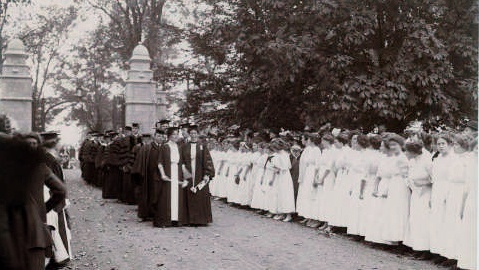 The photos of the College and Founder’s Day, 1910s–1980s, are courtesy of Mount Holyoke College Archives and Special Collections. Trustees churn ice cream for students on Founder’s Day, about 1925. First-year students wait in line for ice cream in front of Glesmann’s Pharmacy on Founder’s Day, 1938. Students Julia Stoddard ’40 (left) and Susan Battey ’40 (right) have ice cream with Mary Sherrill, professor of chemistry, on Founder’s Day, 1939. Staff prepare to serve Deacon Porter’s hat, a steamed brown-bread pudding named for one of the College’s earliest trustees, on Founder’s Day in 1960. 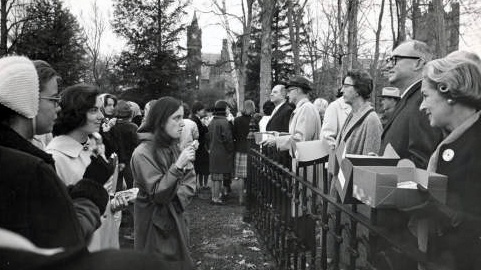 Trustees serve ice cream to students gathered at Mary Lyon’s grave on Founder’s Day, 1964. Students sing around Mary Lyon’s grave on Founder’s Day, 1987.